Twenty five years of executive management and experience leading San Diego educational institutions to develop a skilled and prepared workforce. At Groundwork, Leslie leads the organization to engage community residents to participate in the Chollas Creek Watershed development to live healthy lives and prosper in their neighborhoods. Leslie is a UC San Diego alumna. Native of the Encanto Neighborhoods with over 30 years of professional and volunteer contributions to improve the quality of life for all residents of Southeastern San Diego. With advanced degrees in management and organizational leadership, Patrice leads the community engagement programs and activities for GWSD to ensure that all programs and projects reflect the vested interests, values, and vision of current and future residents. An award winning teacher, educator, and advocate to prepare San Diego youth in STEM education leading to local universities and employment. Accomplished in linking STEM, Next Generation of Science Standards, and Common Core Curriculum to prepare San Diego students for a dynamic future. JoAnna works closely and in partnership with classroom teachers to deliver a relevant and exciting curriculum at the EarthLab outdoor classroom. JoAnna is a UC San Diego alumna. Alex is a graduate of San Diego State University, with a background in working with youth organizations. He joined the Groundwork team to combine his interest in horticulture and drought tolerant landscaping with teaching scientific literacy to students. Alex oversees the EarthLab native plant and fruit tree propagation centers; installs drought tolerant landscapes for residents participating in the Groundwork climate action programs; in the neighboring community; and teaches science to the thousands of students who visit the Earthlab. Alisha is a graduate of UC San Diego in Global Health. 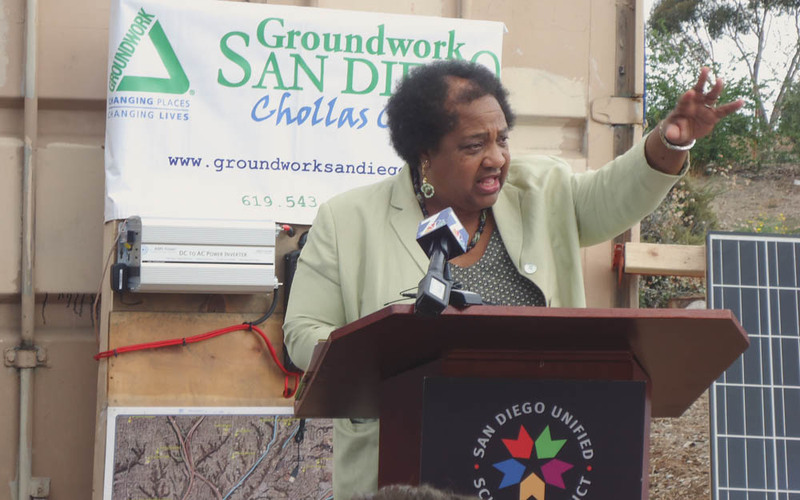 Her recognition the link between health and environment led her to Groundwork, where she accepted a position, funded by the Resources Legacy Fund, to ensure San Diego under-represented communities are the beneficiaries of statewide Proposition 68 and other park/trail funding. Her work is linked to the Parks Now initiative. The Groundwork Board of Directors is a of local leaders with knowledge, skills, and experience who are dedicated to the long-term health and well-being of the Chollas Creek Watershed and its neighborhoods. Serves as a Subcontract Administrator for Northrop Grumman Aerospace Systems. He served as President of the Webster Neighborhood Council where he assisted in the rezoning of the community to reflect its single-family character in harmony with a light industrial business focus. Under his leadership, the most successful Maintenance Assessment District (MAD) in the City of San Diego was approved. He served on the City’s Committee on Government Efficiency and Fiscal Reform, and as Chair of the Encanto Neighborhoods Community Planning Group. He served on the Board of Directors of the Southeastern Economic Development Corporation, and is a founding Board member of Groundwork San Diego-Chollas Creek. has extensive experience in higher education administration, counseling, teaching, and urban planning. He served as Vice President for Student Affairs at Eastern Washington University, and as Registrar at the Pierce College District. At University of California Riverside, he directed student admissions and outreach. He served as a gubernatorial appointee to the Combined Fund of Washington, and a member of the Planning Commission for the City of Olympia. He served as a member of the Advisory Board for the Leadership Development Initiative at the Harvard University Graduate School of Education, and currently serves as an appointee to a San Diego Unified School District oversight committee. Charles Davis is the principal of Urban West Development providing project development and construction management services for residential, office, industrial, retail and environmental projects. He served as Director of Project Development for the Jacobs Center for Neighborhood Innovation from 2006-2013, where he was responsible for project management of housing, retail, environmental and commercial projects totaling over $350 million. He has served as a Board Member of the -San Diego Housing Federation and the San Diego Land Trust. Is Professor Emeritus of Sociology and Education at UCSD. He started the Teacher Education Program at UCSD and directed that Program from 1972 until 1998, when he became the founding director of The Center for Research on Educational Equity, Access, and Teaching Excellence. CREATE coordinates efforts at UCSD to improve the academic preparation of under- represented students. He has helped build equitable educational environments (The Preuss School UCSD and Gompers Preparatory Academy in Southeastern San Diego). He assists the Diamond Educational Excellence Partnership and Groundwork San Diego in Southeastern San Diego by advising those organizations on evaluation measures and educational policies. He has authored 7 books on a variety of educational equity issues; In the Front Door: Building a College-Going Culture of Learning, documents the political and cultural context surrounding establishing CREATE, Preuss, and Gompers. Is the Co-Chair for the Independent Voter Project. The Independent Voter Project works to represents the rights and access of independent voters to the political process. Marston was president and co-owner of Marston+Marston, Inc., a full service public, governmental and community relations firm and, before that, was senior vice president of another San Diego-based public relations firm where he spent nearly four years serving as the lobbyist for the City of San Diego in Sacramento. Marston was a member of the California State Assembly representing San Diego’s 78th District and is active as the Past President of the San Diego State University Alumni Association. Is a TK-5th grade science teacher for the San Diego Unified School District. She serves as secretary for the Webster Neighborhood Council and is vice chair of the Eastern Area Communities Planning Committee. She is a passionate advocate for science education and serves on the leadership team for 52 Weeks of Science Barrio Logan and is the director of San Diego State Universities Aztec Science Camp. Has lived in and worked on behalf of the Chollas Creek Watershed since 1968. She was president of the Montford Point Marine Association Ladies Auxiliary, and volunteered for the American Legion. She was active in the Heroines of Jericho, Daughter of the Elks and the VFW Ladies Auxiliary. She was a member of the Coalition of Neighborhood Councils, the Chair of the Webster Community Council and is now Chair of the Webster Heights Community Development Corporation. Is a general contractor and a graduate of the New School of Architecture in Landscape Architecture . He currently teaches landscape design at Southwestern Community College, and supports Groundwork’s residential drought-tolerant landscape program. Vice President for Planning) is a retired urban planner who worked for the City of San Diego Planning Department for 22 years. His responsibilities included planning for the Southeastern San Diego and Encanto communities and implementation of the Chollas Creek Enhancement Program, an officially adopted City planning document. Prior to working in San Diego, he worked for 15 years with the City of St. Louis Community Development Agency. He is also active in the League of Conservation Voters and other local organizations. Is the Manager of Environmental Engineering for National Steel and Shipbuilding Company (NASSCO), the largest full service shipyard on the West Coast of the United State. Prior to joining NASSCO, she worked for the City of San Diego’s Industrial Wastewater Control Program. Sara holds her Bachelor of Science in Biology from Humboldt State University and a professional Certificate in Project Management. She is an experienced environmental compliance professional with 25 years’ experience working for improved air and water quality in both public and private sectors. Sara was born and raised in San Diego and is married with one son. She enjoys hiking, camping, gardening, and travel. Is principal and owner of TTG Environmental, a consulting firm focusing on environmental planning, project management, compliance and permitting. She is passionate about mentoring students in conservation/planning issues, and recently received the Rosa Parks Diversity award from the Women in Transportation (WTS) in recognition of her outreach efforts with students from Southeastern San Diego. Ms. Wilkinson served as a Peace Corps volunteer in Honduras, Central America and was the environmental coordinator for the National Wildlife Federation. 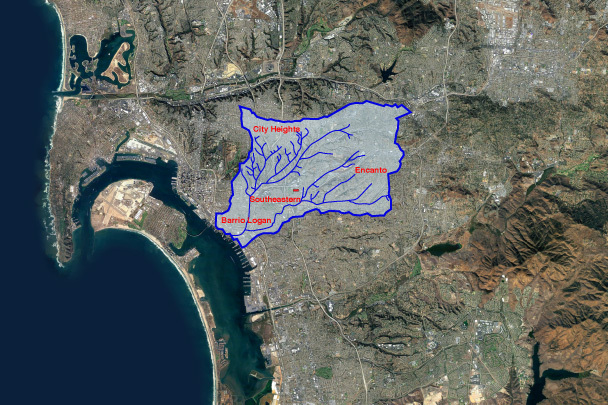 She also co-authored the “Politics of Water Management in the Tijuana River Watershed”. Borderlinks Journal. Is a landscape architect and urban designer and President of Estrada Land Planning, providing land planning, landscape architecture, GIS, re-vegetation, visual analysis, and urban design services. Her projects have included the Balboa Park Master Plan, the Otay Ranch New Town Plan, the San Ysidro Mobility Study, the Rancho San Diego Specific Plan and the Downtown San Diego Streetscape Manual. She serves on the San Diego Canyonlands Board, the County of San Diego Historic Site Board, the Cal Poly SLO School of Architecture Deans Advisory Board, the Media Arts Center San Diego Board, the San Diego Athletic Club Board, the C3 Parks Board, and the San Diego Foundation Board. Marti Emerald excelled as a broadcast journalist for 30 years before taking the oath of office for the San Diego City Council in 2008. Most notably, Marti was the Consumer Advocate (The Troubleshooter) at San Diego’s ABC television affiliate for 22 years, earning more than 100 awards for community service and journalistic excellence. During her tenure on the San Diego City Council Marti focused on repairing the image of City government through fiscal restraint and increased transparency in City government functions. Marti chaired the Public Safety and Livable Neighborhoods Committee during her entire eight years at council. Marti retired from the City Council in December 2016 and lives with her husband Karl Bradley in Imperial Beach. Teddy Cruz is a professor of Public Culture and Urbanization in the Department of Visual Arts at the UCSD, and Director of Urban Research in the UCSD Center on Global Justice. He is known internationally for his urban research of the Tijuana/San Diego border, advancing immigrant neighborhoods as sites of productivity, from which to rethink urban policy and inclusion. He has received the Ford Foundation Visionaries Award, the Architecture Award from the US Academy of Arts and Letters, and the 2018 Vilcek Foundation Prize in Architecture. Fonna Forman is a professor of Political Theory and Founding Director of the Center on Global Justice at the University of California, San Diego. Her work engages issues at the intersection of ethics, public culture, urban policy and the city-including human rights at the urban scale. Fonna serves as the Vice-Chair of the University of California Climate Solutions Group and its Bending the Curve report on climate change; and on the Global Citizenship Commission-advising UN policy on human rights. Chris Kehoe served from 2004 to 2012 as a member of the California State Senate representing the 39th district. She was previously a member of the California State Assembly (2000–2004) and of San Diego City Council (1993–2000). She served as executive director of the California Plug-In Vehicle Collaborative, as one of California’s 55 electors in the Electoral College, and is currently a member of the California Transportation Commission. Groundwork San Diego-Chollas Creek was founded in 2007 at the request of the City of San Diego to lead the master plan for the Chollas Creek Watershed. Initial funding came from the Environmental Protection Agency and the California Endowment in recognition of the role the environment plays in the well-being of low-income citizens. The master plan, entitled the Chollas Creek Enhancement Program, was developed through extensive stakeholder collaboration that represented neighborhoods, community planning groups, nonprofits, and faith-based institutions across the watershed. Its vision was to recover the pre-urbanization beauty of the natural resources of the region through education, advocacy, and compelling environmental design. To this end, Groundwork as generated over $10 million in government and philanthropic funding and engaged thousands of volunteers and stakeholders. The average yearly income for a family of four is between $19,393 and $24,400, within the range of the federal poverty level of $22,050. It is estimated that City Heights only has 1.52 acres of park per 1,000 residents. The population is 51,210, with 78 % hispanic;12 % black;5% white;3% asian.73 % do not speak english/english is not first language, the median income is $29,782, and 33 % below poverty level. There is a 33.13 acre park deficit. The population is 56,757 , with 83 % hispanic; 9 % black; 2 % asian; 4 % white. The median income is $31,414, with 34 % living below the poverty level. The target area is the Encanto Neighborhoods community (population 66,461 in 2011) in Southeastern San Diego. Encanto demographics are 39% Hispanic, 34% African American, and 16% Asian, with over 25% of residents living below the federal poverty level. Encanto’s Area Median Income of $35,000 is approximately half that of the overall region. Students enrolled in the elementary and middle schools serving Encanto are 85% to 100% eligible for free or reduced price meals. Groundwork programs carry impact beyond the local community. The Earthlab figures prominently in the University of California Bending the Curve Report presented by Governor Jerry Brown to the Climate Collaborative meeting in Paris; the residential water conservation upgrade project was nominated to compete for the prestigious Engaging Local Government Leaders national water conservation award; the California Energy Commission-funded Advanced Energy Community Master Plan is being shared as a model of participatory climate action planning for all California low income communities; the EarthLab is a centerpiece of the C4 Climate action work in California; .the Chollas EcoVillage master plan was presented at the annual meeting of the Association of Energy Services Professionals.